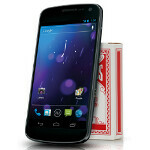 Late Friday word had come that Judge Lucy Koh had granted Apple an injunction against the Samsung GALAXY Nexus. For Samsung, this has to be scary because there are two patents that the GALAXY Nexus had infringed on according to the Judge, that the Samsung Galaxy S III also uses. Samsung has filed an appeal on the injunction order against the Samsung GALAXY Nexus and has asked for a stay on the injunction for the duration of the appeal. Samsung has listed a number of arguments in its filing such as, "The Court's finding that Apple will suffer irreparable harm was based on legally insufficient evidence that Samsung and Apple are competitors." By trying to prove to the court that it is not a competitor to Apple, Samsung is trying to show that Apple did not lose any market share as a result of Samsung's actions. " "The Court's order is inconsistent with the Federal Circuit's directive that market share losses must be substantial." According to Samsung, if Apple cannot prove substantial damages, it should not be awarded the injunction against the Samsung GALAXY Nexus. Samsung argues that the damages must be due to the "infringing feature" itself, which is a lot smaller than figuring out damages based on sales of all of the Samsung GALAXY Nexus units on the market. "The Court's causation finding as to the '604 patent was erroneous, or at a minimum raises substantial questions." The '604 patent relates to unified search as it works with Siri. Samsung argues that Siri is a different feature than the unified search covered by the '604 patent. Judge Koh disagreed and felt that Apple faced irreplaceable harm from Samsung's actions. FOSS Patents does not see Judge Koh staying her injunction of the Samsung GALAXY Nexus for the entire duration of the appeal, but might give Samsung a stay until the Federal Court decides on whether to grant its own stay. Good. Apple can piss off. Only if Samsung abides by the rules and play fair. Are you stupid or drunk? Samsung is playing fair. They aren't suing companies for putting out better products. If Samsung is playing fair why do they keep getting sued for patent infringement? You like bananas don't you? Because Apple doesn't like competition. Where have you been? I don't see the Kindle Fire getting banned or Amazon getting sued. Because the Kindle Fire is crippled out of box. LOL? People need to just ignore him and eventually he'll go away. All he wants is attention, which he gets regularly here. No anger involved. I read a lot of tech blogs/sites and those that are only there to rile people up stand out like a bright neon light at midnight. As they say, don't feed the trolls. Relevant comments and those who actually add something thought provoking great conversations. Unfortunately a lot of great sites get run down by the trolls who only know how to repeat the same thing, on and on and on. Ignore them and they go away. how can i see his comments if all of them are hidden because of low ratings? LOL.. This is standard legal proceedings, but glad to see you value my opinion. Dont worry taco...I am with you..ios fan!! Oh, boy! Another one that we can demolish in debates! The argument that Sammy and Apple aren't competitors is a bit of a stretch.... However, if Siri and universal search are what is compelling to Judge Koh's decision to grant the injunction, it would seem that removing Sammy's implementation of S Voice would address that issue. If removing S Voice avoids an injunction, I would imagine there is a team of developers who are burning the midnight oil as this post is being typed. There is no S-voice on the GNex. This is about a unified search - having one input search multiple ways and return results to one output. Yet another abuse of the broken patent system. i had unified search in my phone even before GNex came out, that includes finding apps, file, contacts web search etc.. and yet apple is only interested in Samsung.. i can bet $1m if motorola or ZTE is the biggest OEM, apple will go for them.. this is apple, this is cry baby at the finest..
remember the injunction is on the Galaxy Nexus witch does not posses S voice, but uses its own set of voice actions (way back there I know right?) and its search bar (go figure) S-voice could be in trouble because in the en some functionality is based on the same things as Voice actions. to the judge is a patent the real question is if Samsung can provide stuff that proved this patent should not be valid on court. another reason why patents should be approved when the company possesses a working prototype. My understanding of the '604 patent is how it integrates unified search with the voice activation ("...what is the current temperature in Phoenix, Arizona?"). Disabling the ability to ask a question and convert the question to a query avoids infringement. Sales of the formerly infringing device can then go forward. I would hope that, too, but this judge has already sided with Apple on two injunctions (the Galaxy Tab 10.1, and now the Nexus), so I doubt she'll be giving Samsung a chance here. I'm serious, she seems to be pro-Apple.